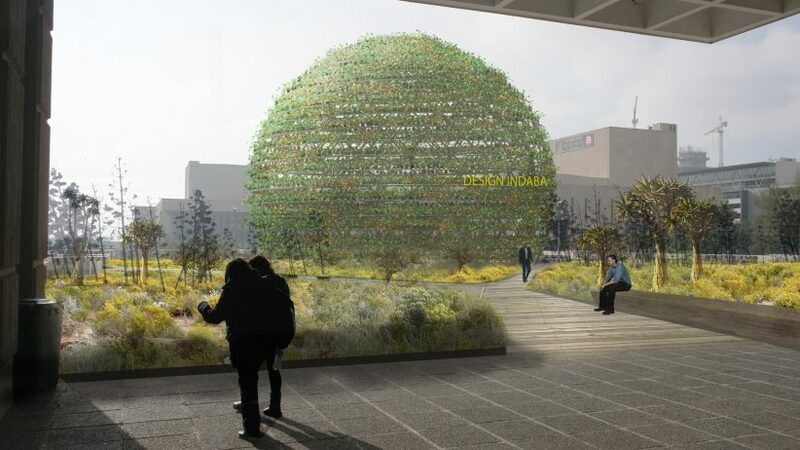 Dutch landscape architect Peter Veenstra has revealed plans to build a plant-covered bamboo sphere in Cape Town’s Luthuli Plaza, providing an extra venue for next year’s Design Indaba conference. Veenstra, co-founder of Rotterdam-based LOLA Landscape Architects, was invited by Design Indaba founder Ravi Naidoo to develop a proposal to transform the elevated plaza, which connects the Artscape Theatre Centre – where the conference takes place – with the city’s transport hub. The designer revealed the proposal for the first time during this year’s edition of Design Indaba, which took place from 21 to 24 February in the South African city, with Dezeen as media partner. He suggested that livening up the neglected plaza could be the first step in creating Cape Town’s answer to the High Line – the hugely popular park created on a disused railway line in New York. The dome will comprise a lattice constructed from sustainable bamboo, which can be grown fast and locally in the South African climate. Veenstra is working with architect and bamboo specialist Olav Bruin of Nomadic Resorts on this part of the design. This bamboo structure will support a huge spread of plants that are native to the Cape Floristic Region. These include Spekboom, an edible, fire-resistant, indigenous plant, of which one hectare can reportedly trap 4,200 kilos of carbon a year. “The dome itself could be the most beautifully planted thing, with the best of the endemic species the Cape has to offer,” said Veenstra. One of the biggest challenges was making the design water-neutral – acknowledging that Cape Town has been in the grip of a severe water crisis since 2015, due to a major drought in the region. To achieve this, Veenstra imagines that all of the vegetation will be grown using a system of hydroponics, a method of growing plants not in soil, but a solution of nutrients suspended in water. The system keeps the loss of water through evaporation to a minimum. To make the growing method fully water-neutral, Veenstra initially looked into re-using waste water from the Cape Town Civic Centre building next door to the Luthuli Plaza, but the water crisis was already so intense there was no waste water available. Instead, he approached a group of Belgian scientists who are working on a method that will “re-use pee from the civil servants” by filtering the liquid by-product and making it suitable for supporting plant life. Speaking to Dezeen shortly after his presentation, the landscape architect said he thinks the project could become a symbol for change, encouraging the city’s occupants to be more responsible with their water use. With the help of Naidoo and Design Indaba, Veenstra’s proposal is set to become reality in time for Design Indaba 2019. As well as providing an extra venue for the conference’s diverse programme, the amphitheatre-like space is expected to house activities all year round. Ideas put forward so far include hosting concerts and exhibitions, providing a lounge space for the city’s Airbnb guests, and facilitating a training course for local street food vendors. “If you go to the harbour side [of the city], for rich people there’s a lot to do. But it could be really interesting if this connects more to the lower and middle classes of Cape Town,” explained Veenstra. The designer said he was taken aback the first time he saw the site. “I got here on a Sunday, there was one guy literally shooting heroin in the corner of the square,” he revealed. But he said he is confident that the site’s position – visible from one of Cape Town’s main artery roads – will help to trigger change in the area. This exposed location does mean that high winds will pose a challenge. To tackle this, Veenstra has stress-tested models at wind speeds of up to 100 kilometres per hour. A single layer of vegetation was too bendy, so the final design will be made of a double layer of bamboo, able to withstand winds without deforming. Veenstra founded LOLA in 2006 with fellow landscape architects Eric-Jan Pleijster and Cees van der Veeken. During his Design Indaba presentation, he showcased a series of projects that the trio have worked on, including several in their home country, the Netherlands. His hope for this latest project is that, as well as well symbolising a more sustainable future for Cape Town, it will create a positive reference to the historic relationship between his home nation and South Africa. The country was colonised twice by the Netherlands. In 1652, when the Cape was first under Dutch rule, the land was cultivated to grow fruit and vegetables to supply the sailors of the Dutch East India Trading Company. Black slaves were imported from nearby countries to work on the farms. 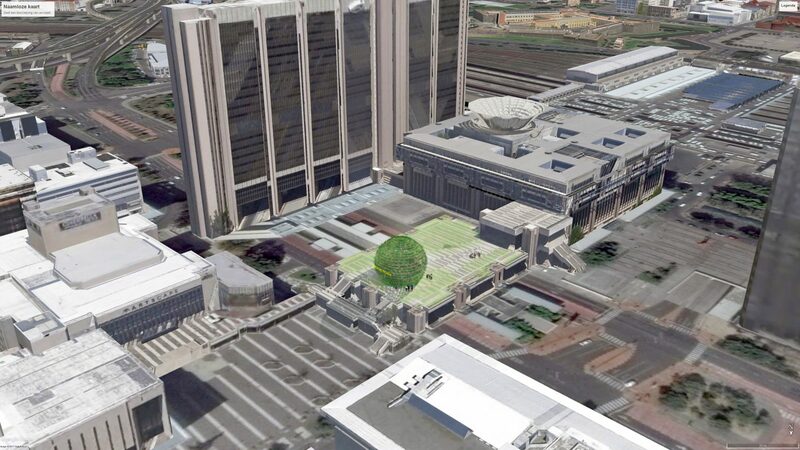 Luthuli Plaza, where the new plant dome will be built, is named for Albert Mvumbi Lutuli, a Nobel Peace Prize winning politician who opposed the minority white government in the 1950s and helped lead the non-violent movement against apartheid.